Chamomile is definitely one of the most popular wild medicinal plants that can be eaten. The two main types of chamomile are the more popular German chamomile and Roman chamomile (Chamaemelum nobile). Although they belong to different species, they are used to treat the same health ailments in herbal pharmacy. Both are used to calm frayed nerves, help in soothing various stomach problems, reduce muscle spasms, and to treat several skin conditions. German chamomile grows in many countries. Distinguishing Features: Chamomile is an annual wild edible. Easily recognized by the tiny daisy-like flowers (measuring no more than 2.5 centimetres wide), one German chamomile flower grows on a solitary stem. Flowers: Chamomile flowers resemble the daisy with white petals circling a cone-shaped yellow centre. Depending on conditions, chamomile flowers bloom between May and October. Fields of Nutrition has medicinal benefits and vitamin/mineral content of Chamomile. Leaves: German chamomile leaves are fern-like light green and feathery whereas Roman chamomile has finely divided parsley-like leaves that are thicker and flatter than German chamomile. Height: Chamomile, depending on conditions, can grow to anywhere from 60 centimetres to 1 metre tall. 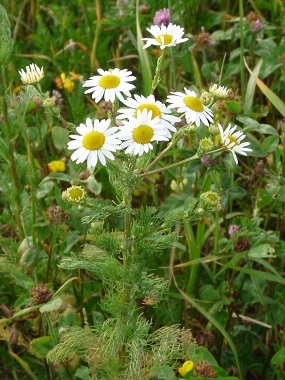 Habitat: German chamomile does well in poor, clay soil whereas its close cousin, the Roman chamomile prefers well-drained and moderately fertile soil. 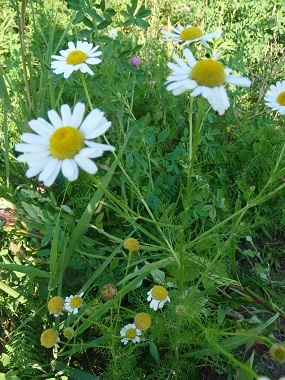 Although both chamomiles thrive in open, sunny locations, Roman chamomile will not tolerate hot, dry weather. German chamomile will also grow in lightly-shaded areas. Edible parts: The chamomile leaves and flowers are edible and they differ in taste. Chamomile flowers have a slight apple taste. Both can be tossed into a salad or a mug to make fresh chamomile herbal tea.